Below is a blog post I wrote for the Times Higher Education. It was edited for publication and may require registration on THE to view it, so is presented here in its original form. Last week, the Co-operative College, established in Manchester in 1919, hosted a conference on ‘Making the Co-operative University’ with the intention of exploring its role in supporting and co-ordinating a federated model of co-operative higher education. Throughout the day, there was a sense of anticipation and historic responsibility among the 90 delegates who were told that in 1909, W. R. Rae, Chair of the Co-operative Union educational committee, had addressed the Union and stated that “What we want and seek to obtain is a co-operative journey that will end in a co-operative university”. Writing at a time when there were only 15 universities in the UK, Rae saw the development of a co-operative university as another example of members providing for themselves where the State did not: “So long as the State does not provide it, we must do, as we have in the past, the best we can to provide it ourselves.” Over the last century, the State has provided a higher education that may have satisfied Rae, but the tripling of tuition fees in 2012 and the incremental corporatisation and marketisation of higher education since the 1980s have angered students, academics and administrators. Once again the co-operative model of democratic member control is being identified as a necessary intervention where the State is failing to provide. Indeed, the “historic” nature of the event was preceeded by a recent decision by the Co-operative College’s Board of Trustees who committed its members to explore a federated co-operative university and all of its possibilities. The federated model of co-operative solidarity is not unusual among co-operatives. In 1944, the College wrote about how it “could become the nucleus of a Co-operative University of Great Britain, with a number of affiliated sectional and regional Colleges or Co-operative institutes, as the demand arises.” In fact, as the Times Higher Education has previously reported, Mondragon University in Spain already exists as a federated co-operative university with a small number of staff serving four autonomous worker co-operative Faculties with hundreds of academics and thousands of students. Jon Altuna, the Vice-Rector of Mondragon University gave a pre-recorded interview for the conference, helping establish how and why the university was set up and the way it is run. Alongside Mondragon were presentations from other groups and organisations that are seeking to provide or already providing co-operative forms of higher education: The Centre for Human Ecology, founded in 1972; The Social Science Centre, Lincoln , a co-operative for higher education set up in 2011; Free University Brighton, running since 2012; Students for Co-operation, a national federation of student co-operatives established in 2013 that supports 24 food co-ops and four housing co-ops; RED Learning Co-operative, a new co-op set up by ex-Ruskin College academics to provide training and education to the Labour Movement and other activists; and Leicester Vaughan College, established in 1862 to provide adult education but recently “disestablished’ by Leicester University and re-established as a co-operative by its staff and local supporters, including the city council. The diversity of these initiatives was celebrated at the conference for meeting local and unmet needs in adult education, while at the same time recognising the limitations of working on the fringes: too much reliance on voluntary labour, insufficient funds and the difficulty of being accredited by an external awarding body. This is where the Co-operative College comes in. The conference was a pivotal event that came about through the efforts of a Co-operative University Working Group (of which I was a member) that was set up to pull together the work that has been done around co-operative higher education over the last the last few years and advise the Board of Trustees on the feasibility of the College acting as co-ordinator and accreditor for autonomous co-operatives offering degrees or degree-level courses. Looking ahead, the conference also aimed to establish a Co-operative Higher Education Forum that could replace the Working Group and be open to anyone interested in co-operative higher education. Representatives from the Forum will advise the College’s newly established Academic Board on the direction to take. After presentations from people in the morning, the afternoon of the conference focused on thematic discussions around Democracy, Members and Governance; Knowledge, Curriculum and Pedagogy; Livelihood and Finances; and Bureaucracy and Accreditation. While not determining the final outcome, there does seem to be a direction of travel for co-operative higher education in the UK: It is likely to be based on the principle of subsidiarity, with democratic control in the hands of the people most affected; membership will be open and voluntary and meaningfully linked to the system of governance providing all members, students, academics, administrators, with equal powers. Teaching and learning will draw from traditions of adult, community and participatory education, involving students and academics in a combined culture of research and teaching. Co-operatives are ‘enterprises’ run by and for their members and there is a recognition that members have to face the risks and challenges of creating sustainable business models that draw on the existing co-operative commonwealth and sources of public funding. Perhaps the greatest unknown at this time is what the relationship between the co-operative movement and the state regulator will look like. The Co-operative College are meeting with HEFCE this month to understand the current regulatory landscape following the Higher Education and Research Act 2017 and are poring over the recently published consultation documents to understand the implications of the new regulator, the Office for Students. If the key requirements of demonstrably good governance, a good quality education, and a sustainable financial model remain the basic threshold for gaining Degree Awarding Powers then there is no reason why Co-operatives, operating on 180 year-old, values-based principles of social organisation, can’t meet those requirements in ways that challenge the existing system of higher education in England with a real alternative. 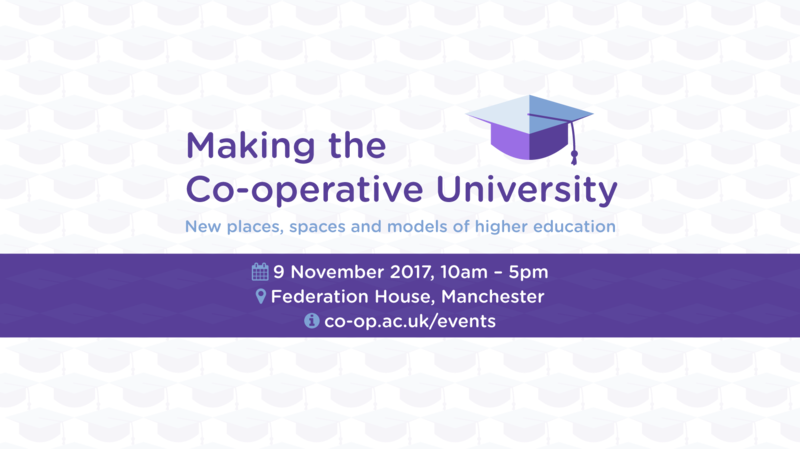 The Co-operative University Working Group are hosting a conference in Manchester on 9th November to focus on ‘making the co-operative university: new places, spaces and models of higher education‘. The aim of the day is to network with like-minded and interested individuals and organisations through active learning and discussion. It is a one day conference which will take place at Federation House in Manchester on 9th November 2017 with tickets priced at £95 and £45 concessions. More details are available on the College’s website. Join us and share your thoughts on what a Co-operative University should look like! How can universities be transformed so that they center on public goods in teaching, research, and community engagement? Mike Neary and I will be speaking in June as part of a theme on ‘How can universities be transformed…’ at the UNIKE conference in Copenhagen. We will be discussing our recent research project on co-operative higher education and contributing to the overall discussion on the public and community purposes of universities. Below is the overall conference strand description. Within higher education, values such as democracy, solidarity, public good and community benefit are increasingly overshadowed by systems of management based on Taylorism and hierarchical control. The session explores these trends and draws on participants’ practical experiences, lessons learnt, and best practices to suggest alternative organizational forms. The session aims to use these experiences to promote both discussion and first steps in developing an audit tool to use to evaluate universities and hold them accountable for their promotion of public goods. Finally, participants will identify some alternative pathways to address the decline of public goods in universities: reform of existing institutions, creation of new institutions, etc. The group will organise a workshop in which participants will brainstorm the principles, issues, approaches (democracy, social justice, pedagogy, ownership, financing, governance) in groups to address the identified problems, moving forward. Author Joss WinnPosted on March 2, 2016 September 9, 2016 Categories BlogTags co-operative university, conference, presentations, UNIKE, universities2 Comments on How can universities be transformed so that they center on public goods in teaching, research, and community engagement? I was on a panel focused on ‘Alternative Ways of Thinking the University’. The title of my paper was, ‘Labour, property and pedagogy: Theory and practice for co-operative higher education.’ The panel (split over two sessions), also included Sarah Amsler (Lincoln), Catherine Butcher (Roehampton), Fern Thompsett (Queensland), Aniko Horvath (Kings College), and discussants, Rebecca Boden (Roehampton), Sue Wright (Aarhus), and Chris Newfield (UC Santa Barbara). It was a real privilege to be able to participate on the panel with them and I have found my discussions with them about alternative, free, co-operative, and other models of higher education really insightful and useful. My paper distilled and summarised three papers I’ve previously written. In the script below, I draw from two previous conference papers (here and here) as well as a journal article which will be published next month. My thinking on co-operative higher education feels pretty solid right now, what with over four years of helping run the Social Science Centre and a number of talks and papers written over the last year or so. The next stage in my/our praxis is to develop a detailed model for co-operative higher education, based on what we have learned and theorised so far, and drawing widely from expertise within the co-operative movement and from colleagues in higher education studies. Mike Neary and I have submitted a small grant proposal that, if successful, will enable us to pursue this next stage of work. When I was first invited to the UNIKE conference, I proposed a paper which was more theoretical and reflective on the political economy of alternative higher education. However, the panel organiser asked whether I might offer something more reflective on the Social Science Centre and co-operative higher education in general, hence why I have drawn on earlier work. It was a reminder that, as is very often the case, people are really eager to learn more about the SSC as a concrete example of alternative and co-operative higher education that continues to exist, despite all the difficulties and energy it takes from lots of people involved. It is wonderful to be here in New Zealand and be told by people from Australia, Denmark, the US, and the UK, that the SSC provides inspiration to their own projects to develop alternative forms of higher education. In this paper, I will reflect on four years of being a founding member of the Social Science Centre, Lincoln (SSC), a small co-operative for free, higher education in England. In doing so, I will argue that, through praxis, we are creating an alternative model to the discipline of wage labour and the pedagogy of debt; one that is grounded in a coherent theory of labour, property and pedagogy. I will conclude by outlining how that model might be expanded into a transnational ‘co-operative university’. This paper discusses work I’ve been doing with others since 2010 to practice and theorise co-operative models of higher education. I’ll be drawing from a recent journal article in which I try to develop a coherent theory of academic labour, property and pedagogy for a co-operative university. The conference theme this week questions the changes taking place within higher education around the world and seeks to understand its various and changing social roles and forms. I want to begin by looking back to an earlier conference to ‘Reimagine the University‘, organised this time by students at the University of Leeds in November 2010. That conference was both an act of resistance to the recent Browne report that indicated the rise in tuition fees, and also an act of solidary, as students and their teachers walked out of their classes and occupied a central lecture theatre. I was there to talk about a new model of free, co-operative higher education called the Social Science Centre. Now, over four years later, I’d like to use my time in front of you to talk about the Social Science Centre, and more generally about the idea of co-operative higher education. In doing so, I hope to offer some ideas that speak to the theme of this panel, which is: ‘Alternative Ways of Thinking the University’. In November 2010, the Social Science Centre (SSC) was little more than an idea that we had written up and were beginning to share with friends and colleagues. It was appropriate that the SSC had its first public outing at the Leeds conference because of the work that Paul Chatterton and Stuart Hodkinson at Leeds had done on autonomous social centres. Their ESRC-funded research project had revealed to us a network of inspiring autonomous social centres across the UK and Europe, which acted as hubs of resistance to the privatisation of public spaces, such as universities. We saw how these co-operatively run Centres collectively broaden and strengthen the efforts of existing social movements by providing space and resource for the practice of different forms of social relations, not based on wage work and private property but instead on mutual aid and the construction of a social commons. Modeled on the social centres, we wanted the Social Science Centre to provide a space for higher education and for developing our work in ways that were impossible within a mainstream university. And what exactly, I am often asked, is the Social Science Centre? The Social Science Centre is a laboratory for experiments in higher education. It is a model that we think could be replicated by other people. It is not and never has been an alternative to everything that the modern entrepreneurial university seems compelled to do. How could it possibly be compared to the University of Auckland, Roehampton or Lincoln? Yet what we can say is that it does provide an alternative to individuals who desire a higher education at the equivalent level to that found inside a university if they wish, with a progressive model of teaching and learning which is reflected in our constitution that insists all members, or ‘scholars’ as we call ourselves, have an equal say in the running of the co-operative. Rather than make the distinction between academics and students, we recognise that we all have much to learn from each other. The ‘democratic deficit’ that McGettigan highlights is undoubtedly a key issue that any alternative form of university must address. However, democracy itself is malleable both as a concept and in practice. What does it even mean to practice democracy here in New Zealand or in the UK, when supranational networks of capital are being formed to effectively control national and international economic processes? In thinking of alternatives to the university, I’d like to suggest that in addition to democracy, a number of other values can be combined to create a sustained alternative to how we think about the organising principles of higher education. This combination of values and principles does not take a single institutional form but offers a framework for reconceiving our social relations, the meaning of work and the purpose of teaching and learning. Taken as a whole, efforts around co-operative higher education over the last three years can be understood in terms of three routes: Conversion, dissolution, and creation. By this I mean the wholesale conversion of existing universities to co-operatives; or the gradual and possibly subversive dissolution of university processes into co-operatively governed equivalents; or the creation of new institutional forms of co-operative higher education. The success of each should not be measured against the apparent success of existing mainstream universities, but rather on the participants’ own terms and the type of higher education they need and desire. The creation route intends to rethink not only the organisational and constitutional form of higher education but also its institutional, physical and spatial and pedagogic forms, too. It seeks to develop a co-operative higher education which recognises and builds on a long tradition of working class, self-managed, alternative, open and radical education. As a co-operative, it is neither public nor private higher education as we usually understand these terms, but instead open, autonomous, democratic, and held in common for the benefits of its members and society. The categories I have started to use when trying to think of and indeed practice co-operative forms of higher education are that of ‘labour, property and pedagogy’. I think each of these are foundational categories with which we develop a new model for education. I’ll briefly say that by ‘property’, I’m referring to the idea of an ‘academic commons’, combining the principles, practices and legal framework of the open education movement with the co-operative movement’s principles, practices and legal framework of ‘common ownership‘. It is not public nor private ownership, but rather a legally constituted form of social property. As it exists today, the university is a means of production employed by capital to reproduce labour in the form of students, and value in the commodity form of knowledge. A worker-owned and managed co-operative university would therefore control the means of knowledge production and potentially produce a new form of social knowledge. 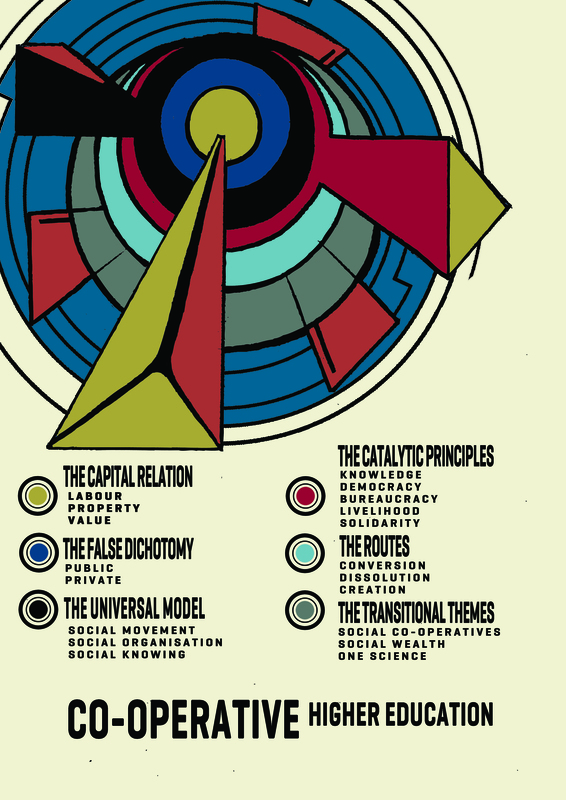 In pursuing alternatives, we need to consider existing models of co-operation and how they might be applied to a co-operative form of higher education; one which is not primarily aimed at teaching students skills for the social factory, but instead aimed at students discovering for themselves the processes of knowledge production, within which we find our own place and meaning. First, we should start with a clear understanding of our intended pedagogic model and always be mindful that the institutional form and our chosen co-operative model are first and foremost derived from the pedagogical relationship that we’re aiming to create in our co-operative for higher education. Second, having established our pedagogical framework, we then need to look at existing models of co-operation. We need to break down the features of worker, social and open co-operatives, identifying their categories of membership, their overall purpose and the ways in which they distinguish between the production of goods and the provision of services, between physical and intellectual property, and the forms of reciprocity between producers and consumers. Are the existing model rules adequate for higher education or do we need a new set of rules? Third, we need to understand how national legislation affects our aspirations for co-operative higher education. To what extent do we wish to align co-operative higher education with the existing funding and regulatory system of universities? It’s a question about what is required by law and also about our relationship to the state and the important idea of ‘public education’. Fourth, we need to work on business models and understand the legal and financial frameworks that might inhibit and support the financing of co-operative higher education. I think we should start small, not attempting to imitate existing universities and everything they try to do. We should consider what services, other than teaching and learning, members can provide in exchange for income but also in exchange for other services provided by co-operatives. We need to plan for forms of mutualism, seek support from the national and global co-operative movements and from trade unions; we need to talk to real co-operative banks, credit unions and philanthropic trusts; consider various membership funding schemes, and think of ways that both academics and students can be paid for their work, as is the case at some liberal arts colleges in the USA. Fifth, social/solidarity or multi-stakeholder co-operatives rely on non-monetary forms of reciprocity, often in the form of volunteers. We need to think carefully about the role of volunteers and our dependence on the volunteering of time and energy by all members to ensure that various forms of reciprocity are recognised and valued and that members are not exploited. 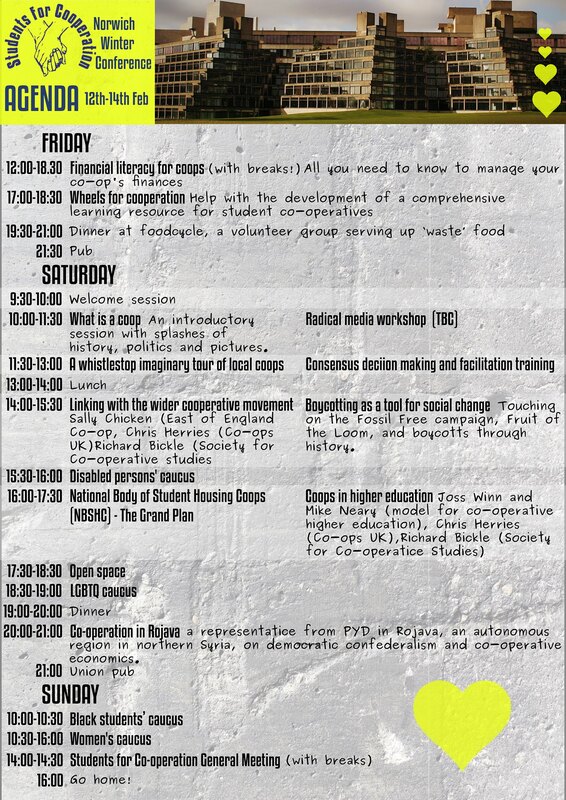 As some of us conceive it, a ‘co-operative university’ is not simply a form of resistance against what the university has become; but, rather, it is a dialectical response which recognises that the conditions for a new social form of higher education already exist and the time has come to organize the co-operative alternative. Here are our slides for the Academic Identities conference, 8-9th July 2014, Durham. The abstract is also below. A paper will follow sometime this summer. I led a discussion at the Discourse, Power and Resistance conference last week, which rested on the question of whether a ‘co-operative university’ is an appropriate and adequate response to the crisis of higher education. The discussion was rich and engaging and consequently my notes are sparse and banal, but I will try to collect a few thoughts here now. The conference was comprised of academics, educators and activists who share a mutual sense of despair, anger, irritation, and fear for the future of higher education in the UK and elsewhere (the conference was 50% non-UK delegates). The opening keynote for the conference from Prof. Richard Pring set the tone by detailing and lamenting the various neoliberal reforms that have occurred across the education sector in the last two decades. While taking questions, one delegate asked the obvious question: “So, what is to be done?” Pring had no real answer, except to propose that a professional ‘council’ be established to protect the interests of the profession. Understandably dissatisfied with that response, someone else said that it required educators to engage in acts of subversion and that many of us are already doing so. We should recognise that the classroom still remains a space of relative autonomy. I wasn’t convinced by that. It may be the case, but those days are numbered. Finally, someone else appealed to us all to organise and strike. In that context, our discussion the next morning about co-operative higher education had something to kick against. Might the idea of a co-operative university, or more generally, co-operative higher education in a variety of forms, be another, more adequate response to the question: “So, what is to be done?”? As I’ve noted before, I think it could be and the general tone among the 15-20 participants during our hour-long discussion was one of curiosity and interest. Conversion: Constitute universities on co-operative values and principles. Read Dan Cook’s report: ‘Realising the co-operative university‘. Dissolution: Radicalise the university from the inside, starting with the relationship between academics and students. Read about Student as Producer. Creation: Build experiments in higher education outside the financialised sector. Read about the Social Science Centre. Throughout the discussion, I kept the slide containing the co-operative movement’s values and principles on the screen so as to establish some of the constitutional features of a co-operative university. Participants spoke about their own efforts at establishing those values and principles in their current work, ranging from individual efforts in the classroom, the design of degree programmes and the establishing of formal centres within their institutions. Broadly, these came under the ‘Dissolution’ route and in my case I spoke about Student as Producer as such an example. Other points of discussion touched on the role of students, who are “increasingly self-commodifying” – how can we work with them to realise an alternative form of higher education? Where are the students at DPR? Does their opinion matter at this stage or is this more about academics determining their own future first and foremost? We should be “bold and resolute” with students. What is the university for? Knowledge? The re-production of labour power? What does work look like in the future? Some participants had “given up on the university” and saw the future as one, not in dialogue with the institution but with students. We were reminded that “there will be dangers” as we move forward.